In 1963, Robert K. Abbett was commissioned by Ballantine Books to paint the covers for Edgar Rice Burroughs’ Barsoom series. 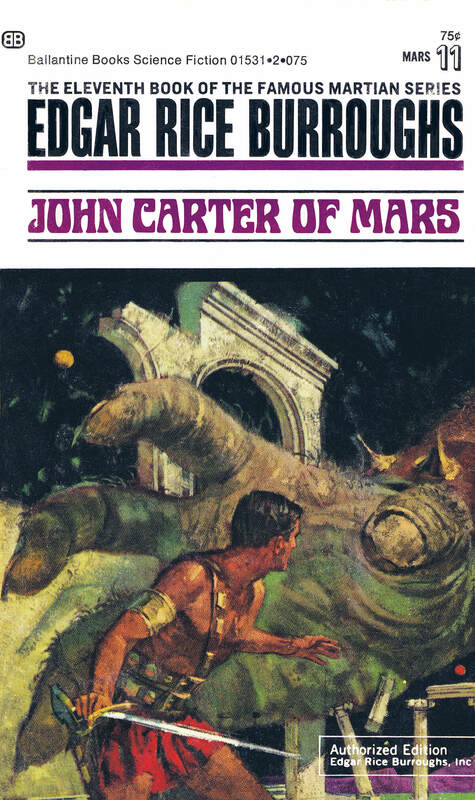 1965 saw the addition of John Carter of Mars as the 11th book, and Thuvia received a new cover in 1969. Abbett would also paint a Tarzan series of covers. For the two different editions of Thuvia, I’ve read two stories. The first is that Ballantine accidentally published one of Abbett’s roughs (Thuvia with the banth), and they didn’t correct it until later. The second story is that John Carter helping Phaidor out of the flier was too risqué for 1963, what with the skimpy bikini, and going with the more chaste mini-skirt was the compromise until society caught up. I’m sure someone more knowledgable than myself will bring some clarity to this. Abbett was one of the premier illustrators of his day, eventually leaving the commercial art game to master another field, painting dogs for the print and gallery market. I haven’t been able to gather a complete set of virgin art to include here yet, but I did find a few of them. Amazing covers! Have always been some of my favorites! These are awesome. Capture the characters better than the ‘look’ of the film I just saw! The flyers on these book covers have always been my idea of what the Barsoom flyers should look like. The flyers in the film just don’t do it for me. I’m thinking that’s Phaidor on that original Thuvia cover. Blonde, fair skinned, and has that haughty look. I’m establishing my ancient age as I mention that I still have all of the original Ace and Ballantine books of ERB from the 1960s. The artwork of Robert Abbett does, indeed, remain the definitive standard for the Martian novels as well as most of the Tarzan novels. The artwork is definitive enough that it’s the only viable means of scratch-building a 2-man Barsoomian scout/flyer. Not sure of the scale I’ll be using, but it’s based on the illustration from the 1969 cover art from Thuvia. (To the reader who wasn’t sure of the warrior… that’s Carthoris, and the young lady is Thuvia.) The design also goes to the cover of Swords of Mars. Best guess is a scratch-built model of about 10–12 inches in length… as soon as I can finish this 31-inch model (1/69th scale) of Disney’s Nautilus… (redesigned an LED circuitboard to show different lighting formats). Enjoyed reading your article here and I appreciate that you had the good words for the artistry of Robert Abbett. Hope to continue this correspondence. Thanks for taking the time to reply, and for sharing your model-making efforts. I know we’d all love to see photos of your work when it’s done. I wrote to Ballantine Books in 1966 to ask about the covers and was thrilled when someone there (Robert Abbett?) sent me a collection of the flat covers and the original oil or acrylic art for the Llana of Gathol cover. I still have the letter, the covers, and the original. It was a huge gift to a teen age fan and has been long appreciated. That is one heck of a story, David. Thanks for sharing. I was amused when I figured out what all that “sixth ray”, the ray of flight or whatever, was. The first ray had to be alpha rays which are just Helium nuclei. Burroughs was just being up to date. If the first ray could float lighter than air craft, surely the sixth ray could do it better and even do more. P.S. I read the books with the Frazetta covers. The men portrayed were as ridiculous anatomically as the women, but, hey, they’re Martians.